Republican presidential candidate Ted Cruz held a town hall meeting Wednesday morning, the first of five events across New Hampshire as he tried to win over voters. Meeting voters face-to-face six days before the primary, Cruz talked about the biggest, most overarching reason he is running for president. "I believe the central issue in 2016 Will be reigniting the promise of America," he said. "Getting back to that fundamental commitment that our kids will have a better life than we did, and their kids will have a better life than they did." 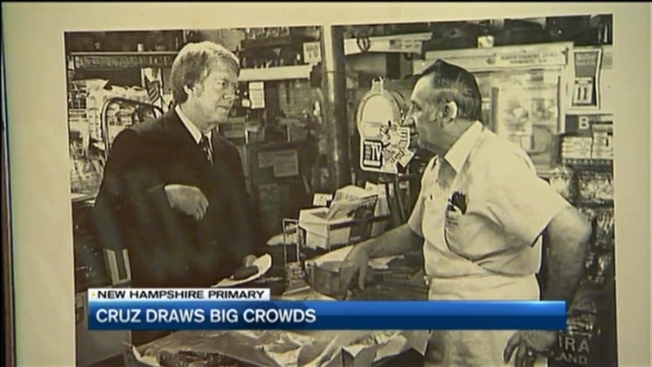 After Cruz spoke with voters at Robie's Country Store, a political hotspot since the 1950s with the memorabilia plastering the walls to prove it, he spoke exclusively with necn. "I think people are fed up with Washington," Cruz said. Cruz says meeting with undecided voters is crucial to his campaign. "This is very much how we won the state of Iowa," he said. "We ran a grassroots campaign going to hundreds of little coffee shops and VFW's and people's living rooms." The event was at New England College at 10 a.m.
Cruz will also be holding meet-and-greet events in the state throughout the day.